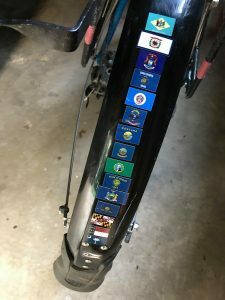 As Doug Smith’s journey on his bike has concluded, we ‘d like to thank the many folks who’ve helped us raise funds to provide arts education programming at SMARTS Community Art School. We’re grateful to all our supporters who “donated by the mile” and to all our friends who volunteered to help sell these mile tickets. We’d also like to thank our generous State Sponsors—the Cala Family (IDAHO), Merrill Lynch Wealth Management in Canfield OH (MINNESOTA), and the American Association of University Women–Youngstown Branch (OHIO). We’d be remiss if we didn’t also acknowledge Jena Root, Doug’s wife, as well as all their friends who gave respite to Doug along the way. That includes all the Warm Shower Hosts, dedicated bike shops, friendly passing cyclists, and all who aided or simply cheered Doug on through the course of his journey. And finally, we’ll thank Doug Smith one more time for his incredible endurance and joyous spirit. Your tireless efforts to complete this fundraiser represents our commitment to bringing arts education to this community. May we all NEVER STOP Believing! 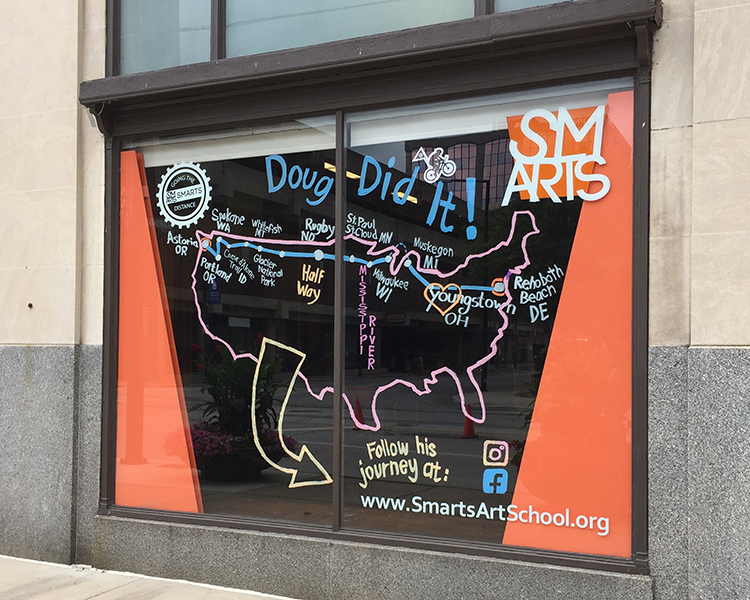 We do ask that you come by to see our final Going the Distance for SMARTS window update and find out all that we provide our students through a tour of our facilities at 25 E. Boardman St. in Downtown Youngstown. And visit our web site at https://www.smartsartschool.org/ to keep donating on behalf of Doug and this great fundraiser!